Clockwork Angels: The Novel charted at #27 on the New York Times Hardcover Fiction Best Sellers list for September 23 - Oct 7. 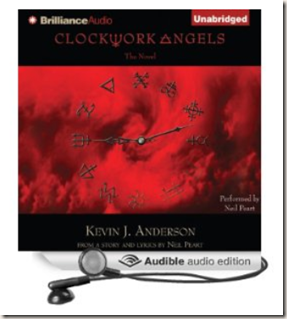 Clockwork Angels: The Novel debuted at #18 on the New York Times Hardcover Fiction Best Sellers list for September 16. I've been listening to Neil Peart narrate the audio version of the novel, which has been quite a treat. I always knew Neil had a great voice for reading, but he's also a natural storyteller. It helps that he he came up with such a rich story, and Kevin J. Anderson filled out the story with some really beautiful writing, descriptions, and characters.